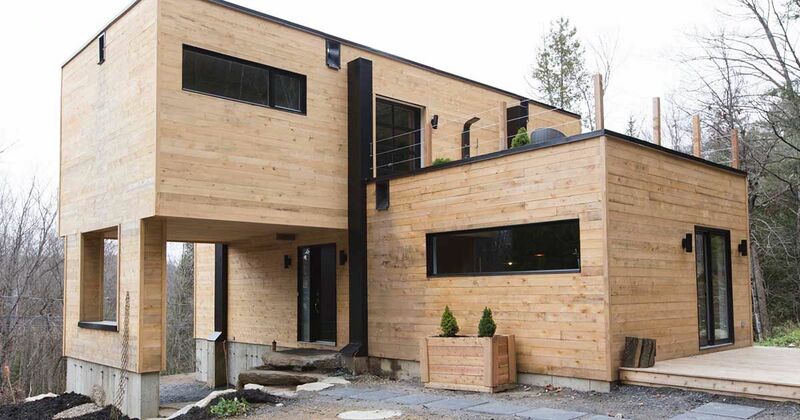 ​Built from two shipping containers in Quebec, Canada, this gorgeous home provides its resident with 1,920 square feet (178.4 sq. m) of luxurious living. The home features three bedrooms and two and a half bathrooms, with edgy details and memorable accents that make this home really unique. 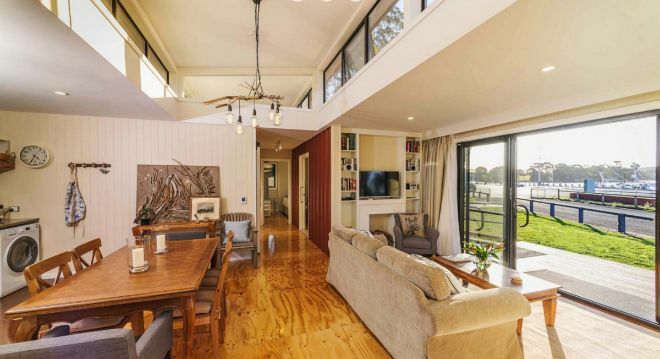 Nine-foot (2.7 m) ceilings, polished concrete floors and oversized windows create not only a visually appealing space but a functional home as well. 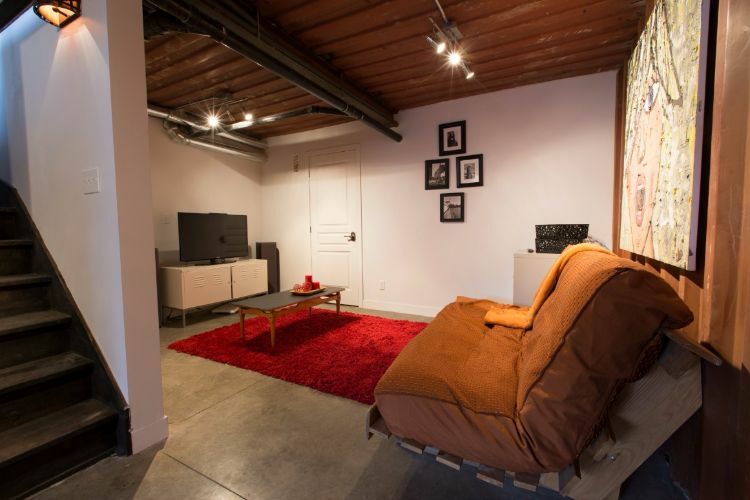 The living room has an industrial feel that's modern and upscale. 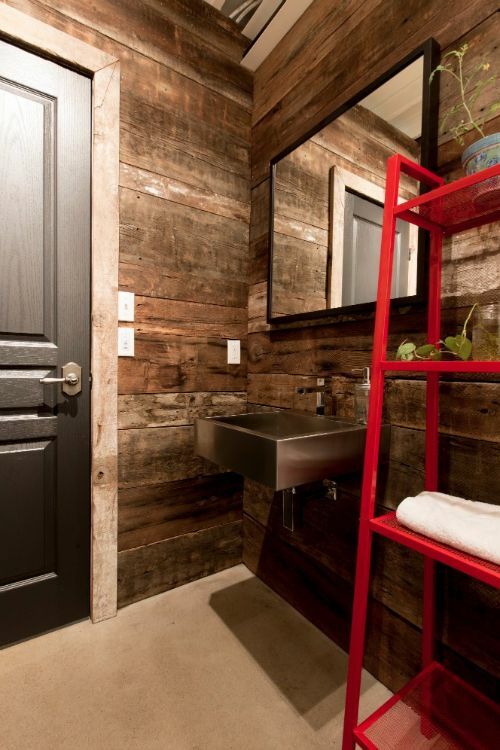 Exposed metal walls and reclaimed wood add texture and nuance to the room. 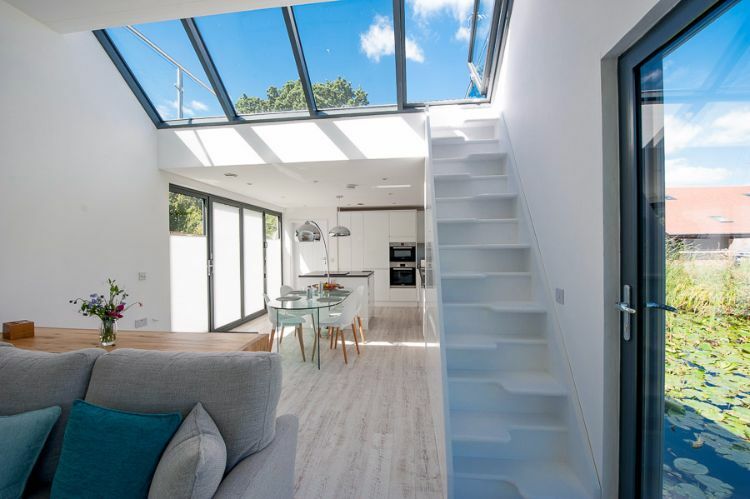 The window wall lets in just the right amount of natural light. 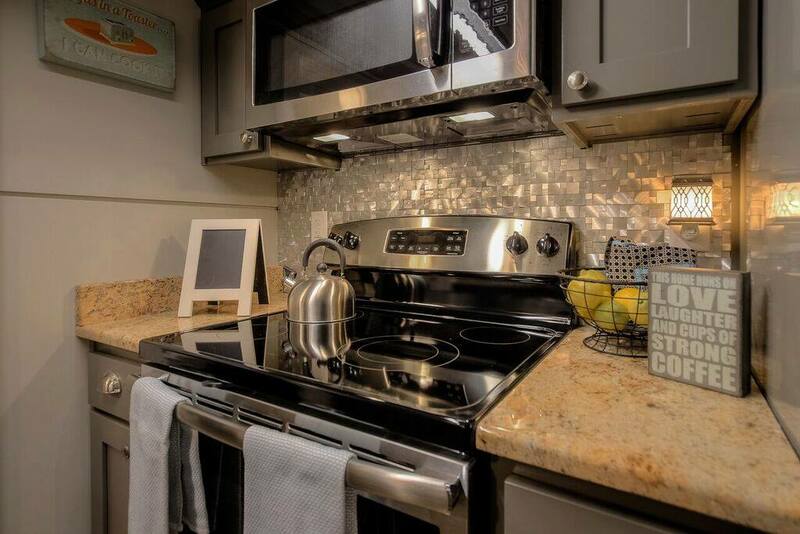 ​The gourmet kitchen shines with stainless steel appliances, featuring an oversized range, oven, center island and sink. There are built-in cabinets around the stainless steel refrigerator, and overhead shelves save space in the room. Exposed tubing left out due to electrical constraints actually adds an interesting look to the room. Oversized wooden doors disguise a pantry for food storage. 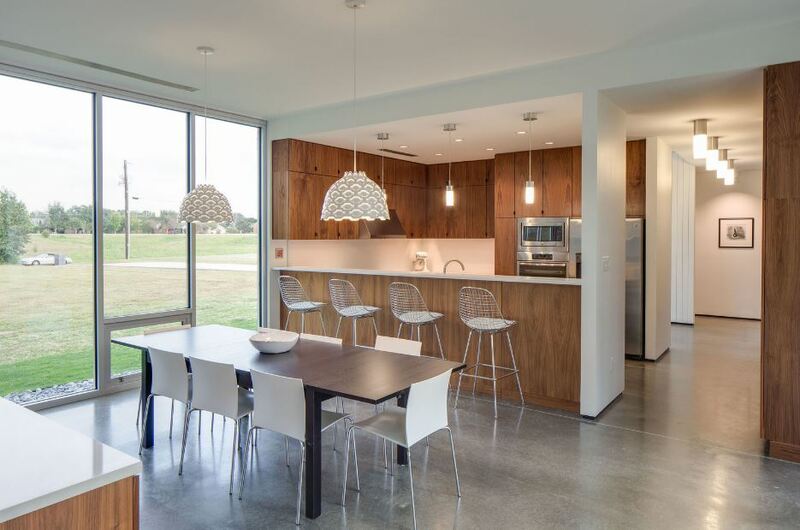 ​The wooden dining room table looks right at home underneath warm, glowing pendant lighting. 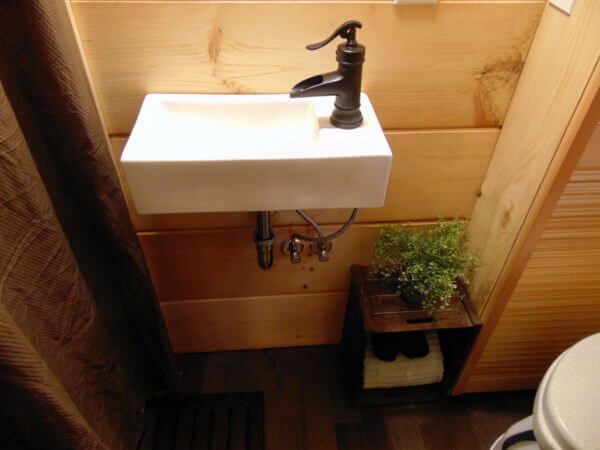 ​The powder room, or half bathroom, features a sink and toilet along with reclaimed wood walls for a rustic feel. Metal shelves add a welcome pop of color to the room. 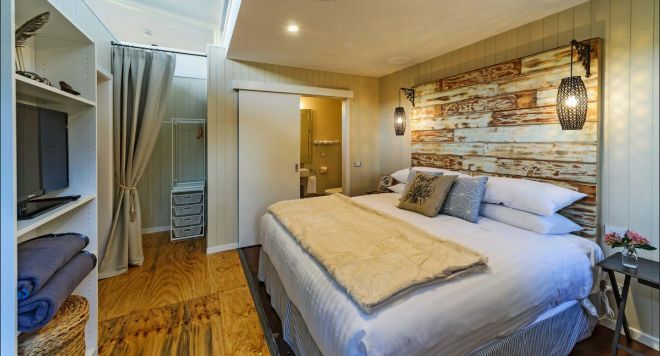 Check out the bedrooms and admire the reclaimed wood wall, which is 18 feet (5.5 m) high, It's gorgeous and eye-catching! Pendant lighting showcases the space and highlights the wood even further. 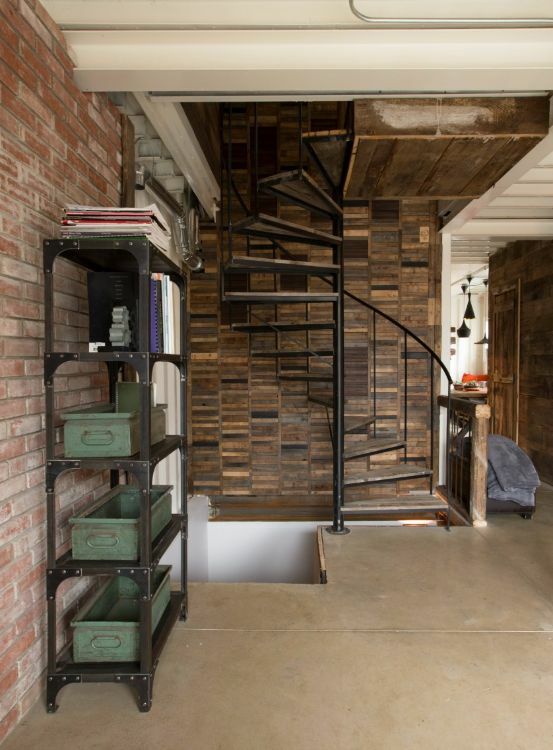 ​The winding staircase is really cute and charming, and exposed brick walls complete the home's industrial theme, along with decorative metal accents and shelves throughout the home. 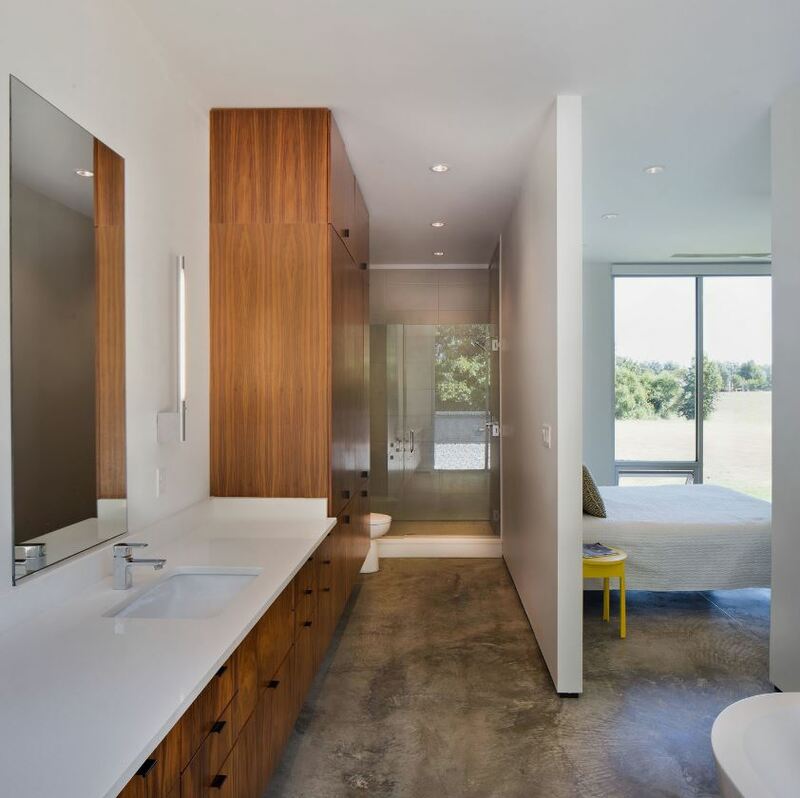 ​The master bedroom has an open floor plan with an adjacent toilet and open-area bathtub. It has a sophisticated feel that simply says "home." 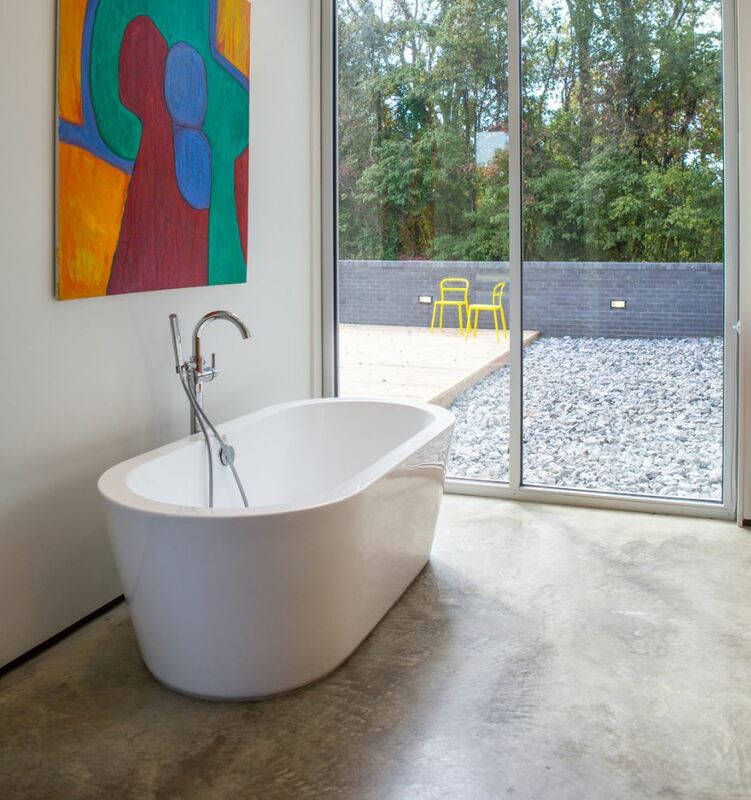 ​The bathtub, located directly in front of another window wall, is simply glorious and airy. ​A vintage vanity holds a ceramic basin, adding to the funky, antique vibe of the space and giving the room added colour. 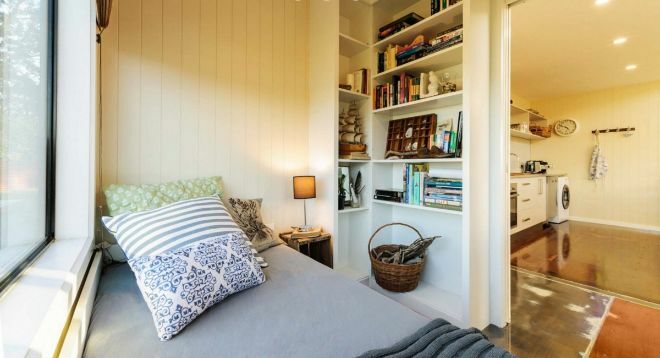 A small room located off the bedroom is outfitted for reading. Hanging vintage lamps and colourful rugs continue the groovy feel of this bedroom. ​The home even has a basement, which is simply called the TV room. A futon can accommodate overnight guests if necessary. 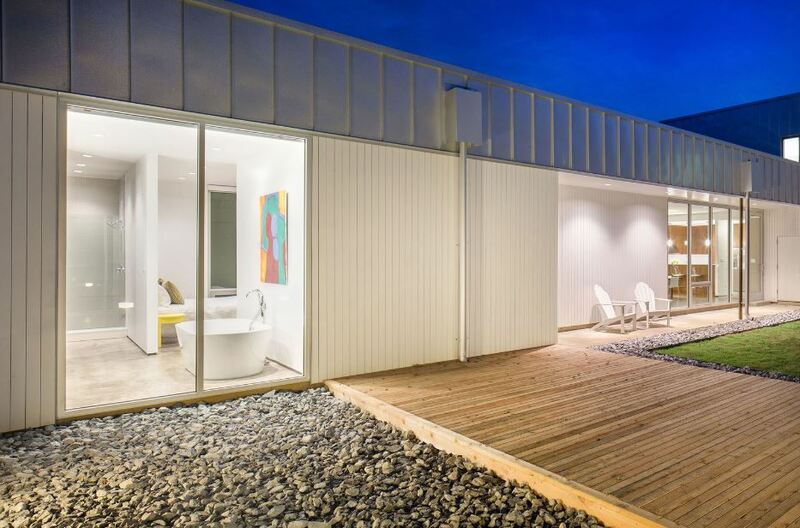 ​Sneak outside the master bedroom to the rooftop deck, where you'll find a private outdoor shower. What a peaceful way to get clean! 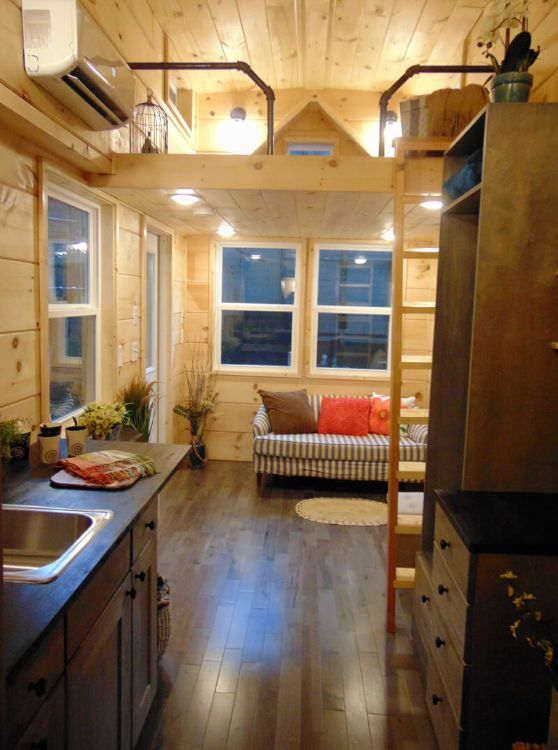 There are plenty of reasons someone would want to purchase a tiny home , 78 percent of tiny home dwellers own their own home, compared to 65 percent of traditional home buyers. 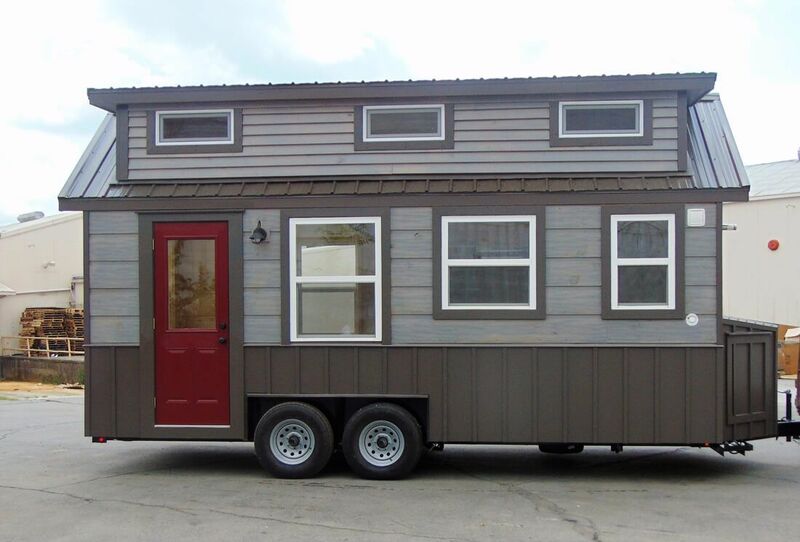 65 percent of tiny home owners have no credit card debt, likely helped by the fact that the average tiny homes are 10-times cheaper to build than a traditional home. 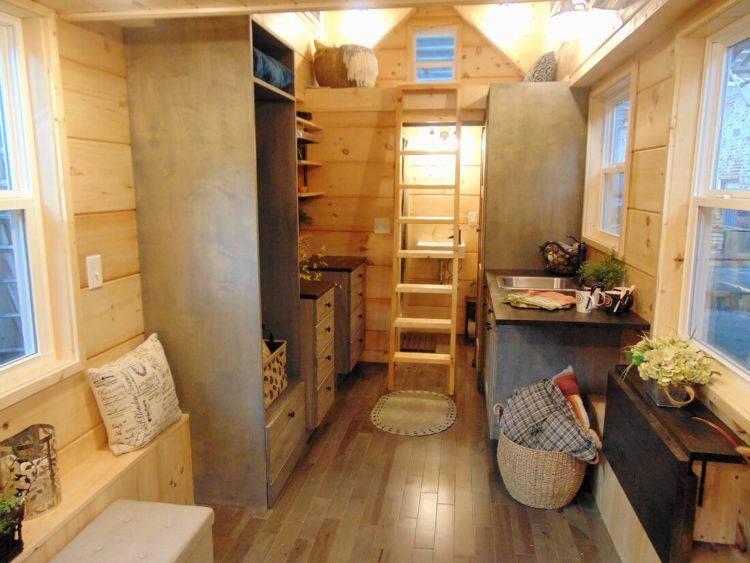 While tiny living isn't for everyone, this adorable modern home shows you just how easy it is to pair function, comfort, and style in even a tiny space! 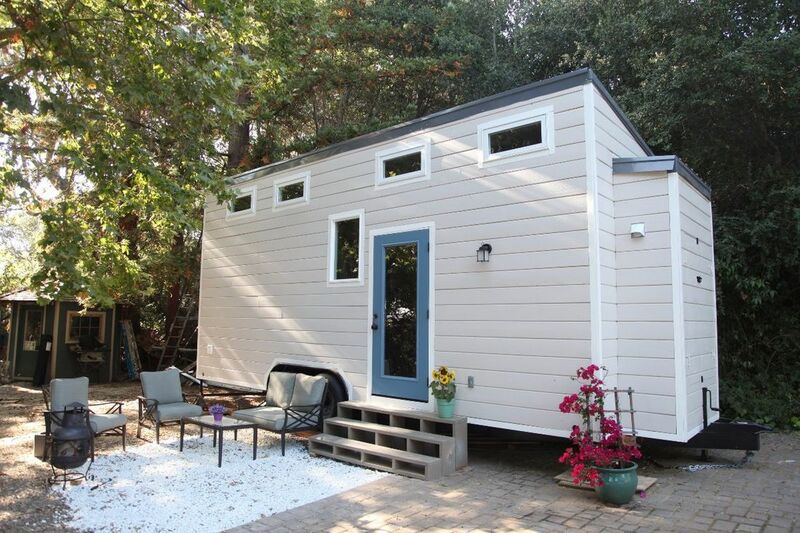 The house from Dream Big, Dwell Small, featured here is only 300-square feet, but it feels much bigger. 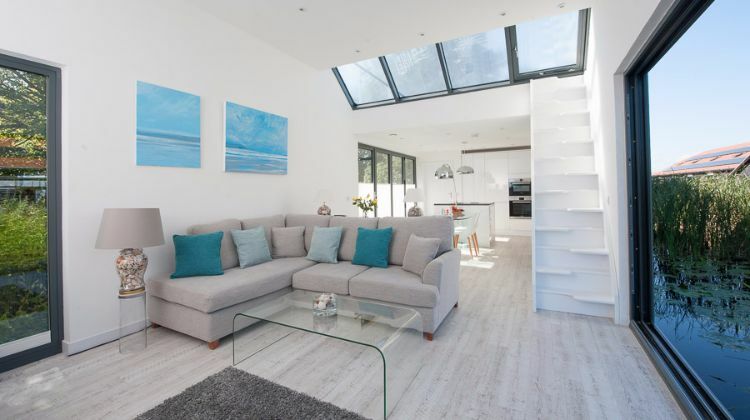 ​This living room area feels very spacious, thanks to the vaulted ceilings. 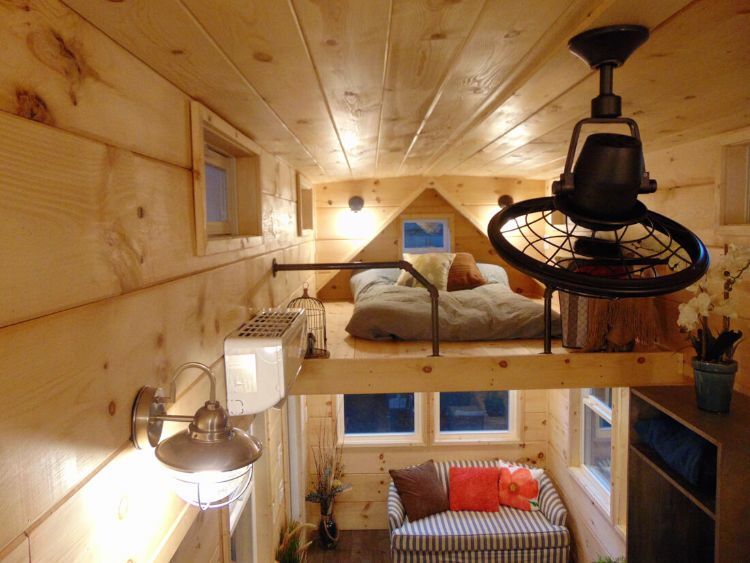 The four-foot loft provides additional sitting, reading or storage space. The home also features 11 doors and windows for plenty of natural light. ​This modern kitchen features stainless steel appliances, a full-size microwave, spacious fridge, stainless steel custom sink and shelving for food storage. ​The Chef's kitchen has a whopping 16-feet of counter space, a full-sized pantry, and a full oven. 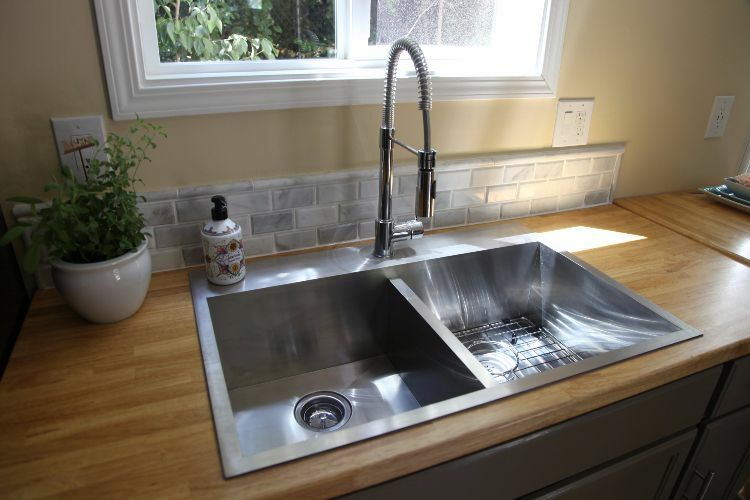 ​The stainless steel sink features a pretty stone back splash with the perfect view to the great outdoors. 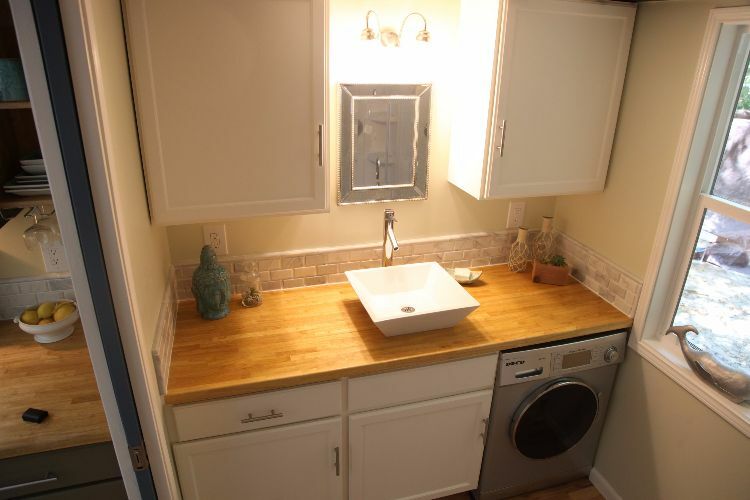 ​Tucked under more cabinet space in the bathroom is a washer-dryer combo that makes laundry duty a little easier. The same backsplash featured in the kitchen carries throughout the bathroom space. 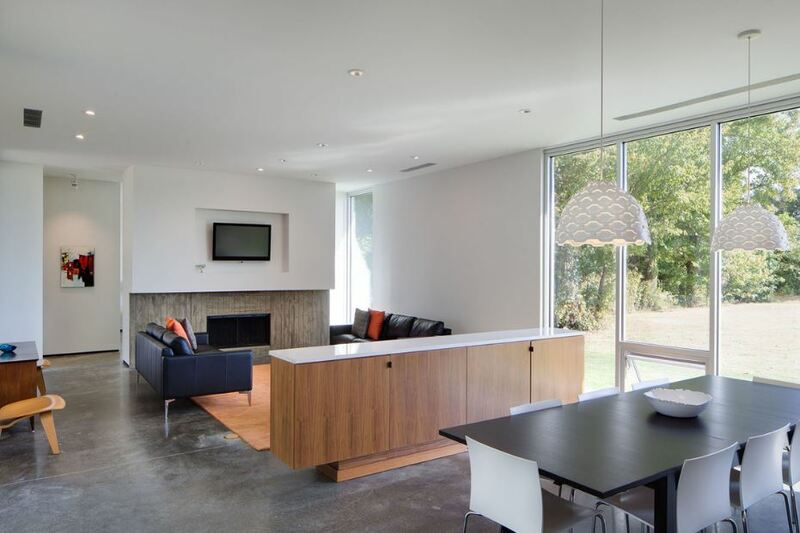 ​The strategic design and layout of this home create an open, functional living space that is modern and comfortable. 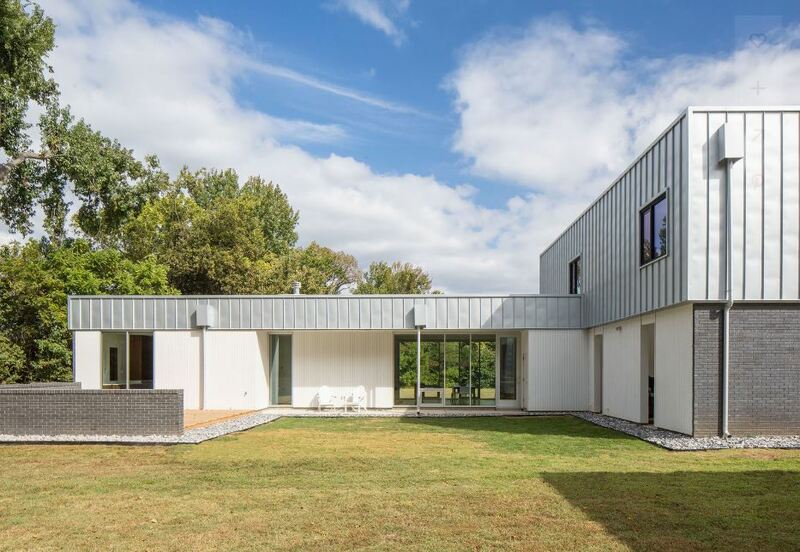 A family with three children moved to a small, rural, west Tennessee town where they sought a house filled with light and large windows, and requiring little maintenance. This house is an exercise in making the most from a little. 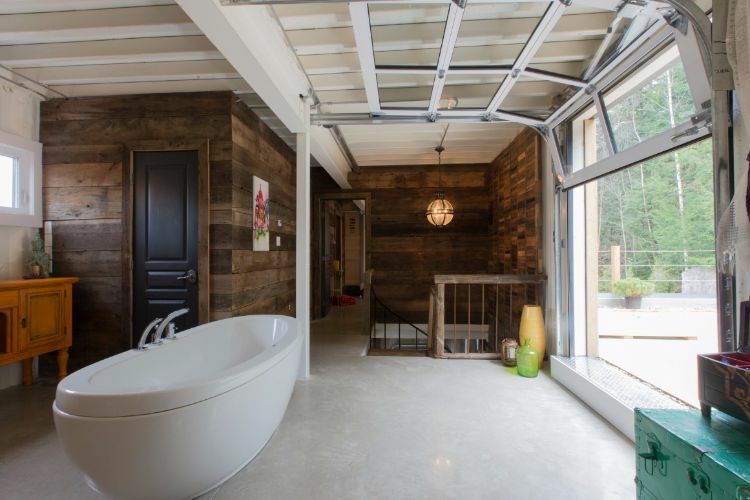 With a low budget and an owner acting as his own contractor (with no prior experience), the design of this house is intentionally simple, focused on clean detailing, abundant natural light, and a basic structural system of timber framing and one piece of steel. 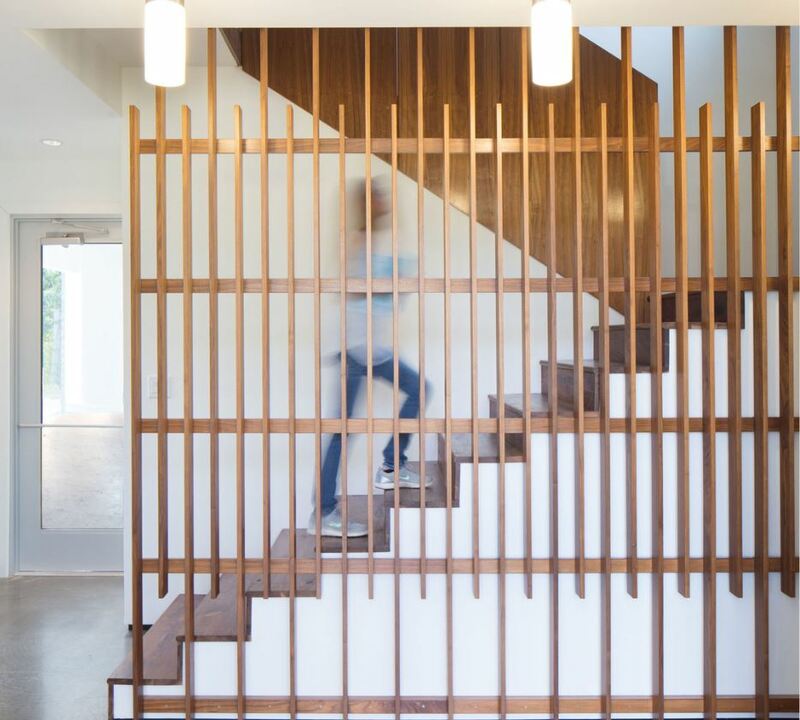 The footprint of the house forms an “L” shape, adding privacy to the rear lawn and deck. The public spaces of the house occupy the long leg of the “L” with large windows opening to both front and back. A master suite is positioned to the northern end while the short leg of the “L” is elevated to a second story, housing kids’ bedrooms, bathrooms, and a small play room. 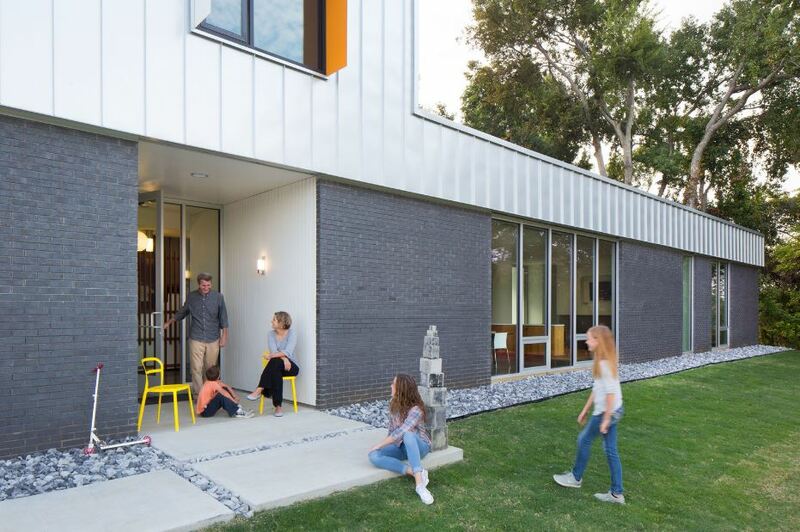 Neighborhood covenants required masonry veneer, thus graphite brick wraps the base of the house and outdoor deck, interrupted only by floor-to-ceiling windows or where the brick gives way to the inside faces of the “L”. 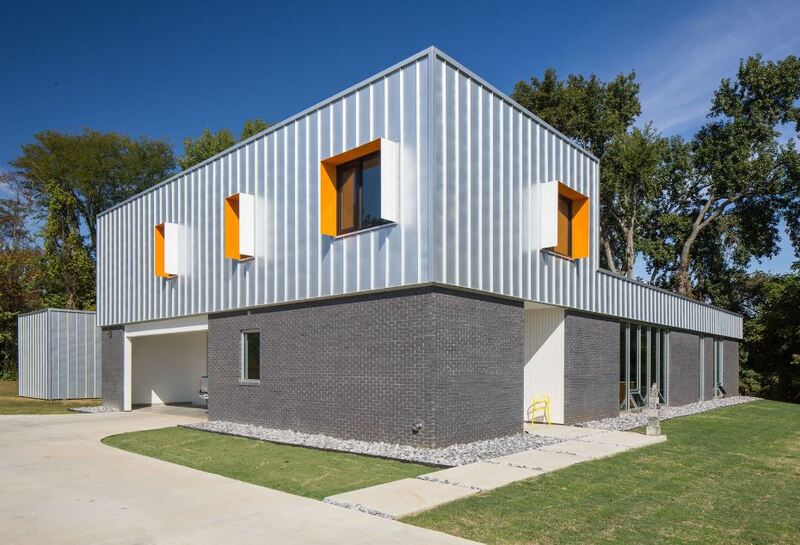 Roof structure extrudes vertically to clad the second story, seamlessly integrating the lower and upper volumes. 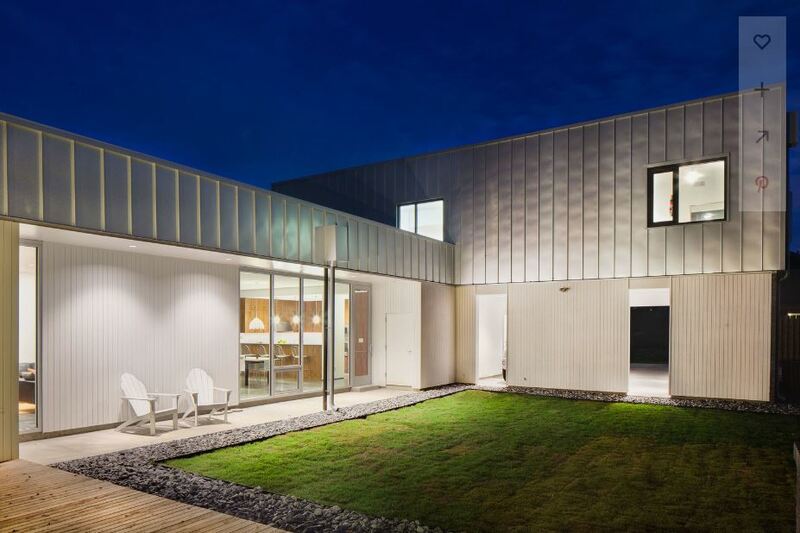 The house is undeniably contemporary in its response to client demands and site/environmental conditions, yet perfectly at home in its small-town context. 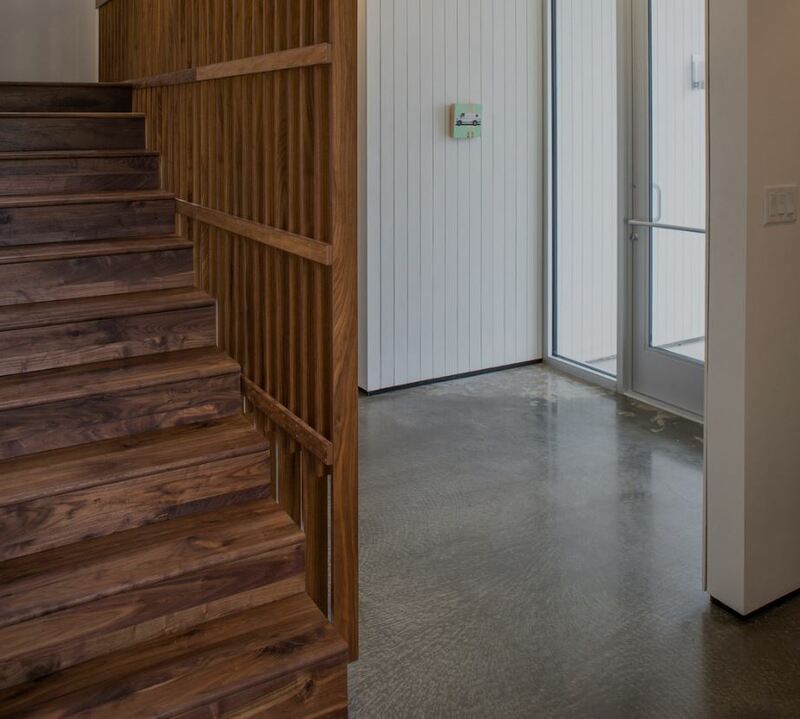 ​Inside, the luscious hardwood flooring provides a nice contrast to the matte wooden walls. 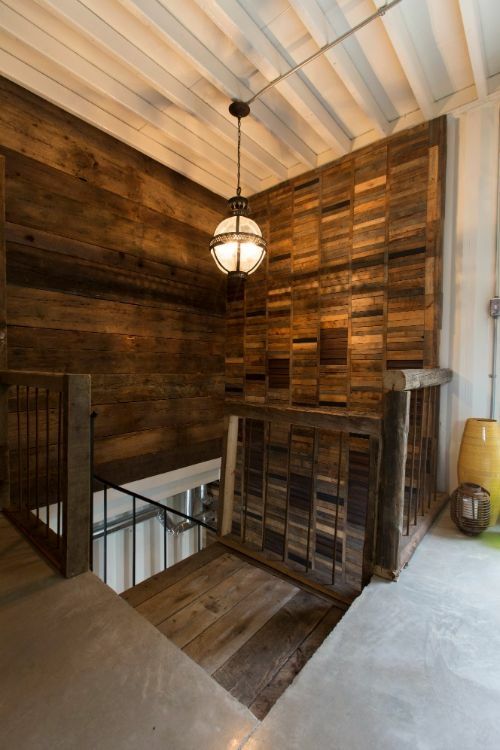 The rustic lighting fixtures, and surrounding decor, add an interesting dimension to the upper level. When most people talk about shipping containers, they probably imagine dirty, dark, metal containers that smell of sea water. 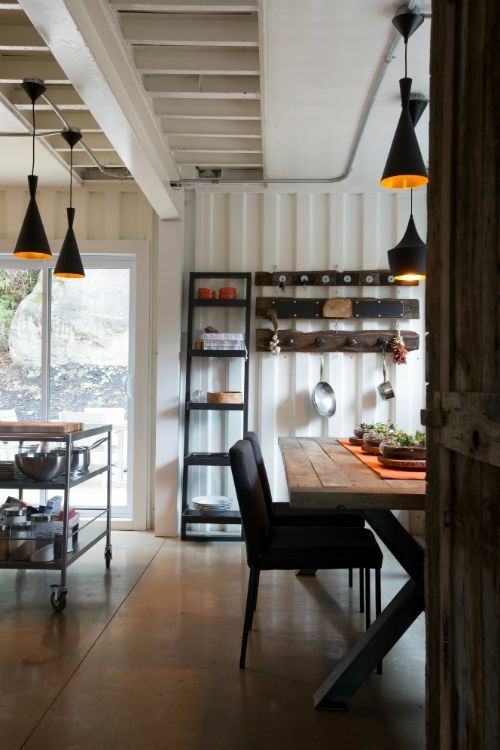 But these shipping containers will change your mind after being transformed into stunning accommodations! 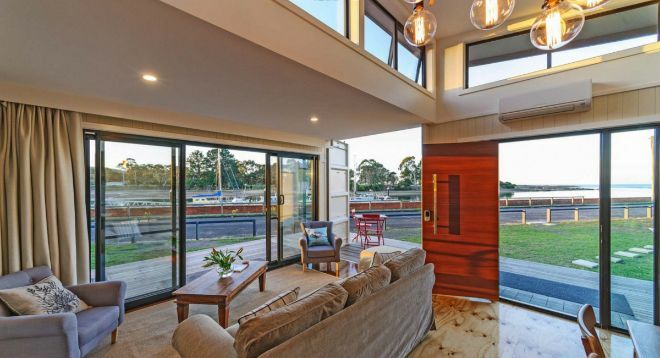 ​The sliding glass doors provide stunning views of a nearby port and offers natural lighting. 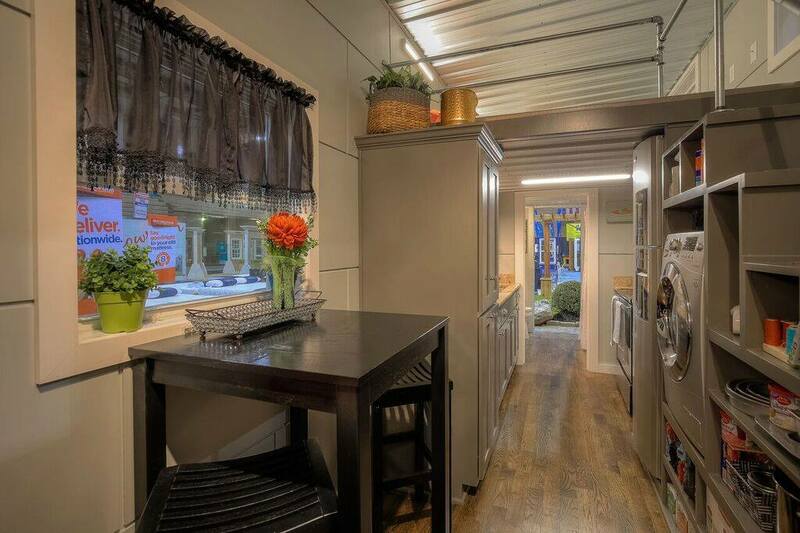 Offering a bright living space, these converted shipping containers are also wheelchair accessible, via ramp. 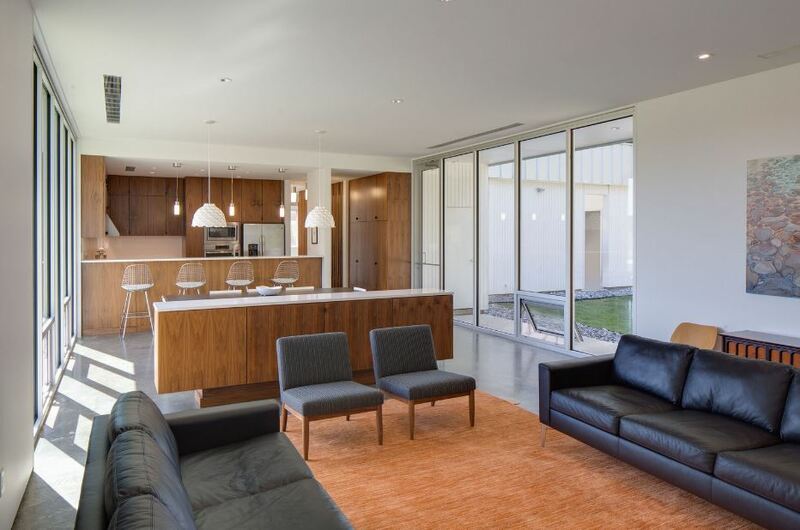 The home consist of an open-space sitting area and kitchen area. ​If the large seating area and full-sized kitchen (including an oven, stove, full-sized refrigerator and microwave) aren't enough, one push of a button lets you adjust the atrium windows for a little extra breeze. ​The master bedroom may be something to write home about. The king-sized bed and private deck area scream luxury and relaxation. There's also a second bedroom equipped with a king-sized bed as well. 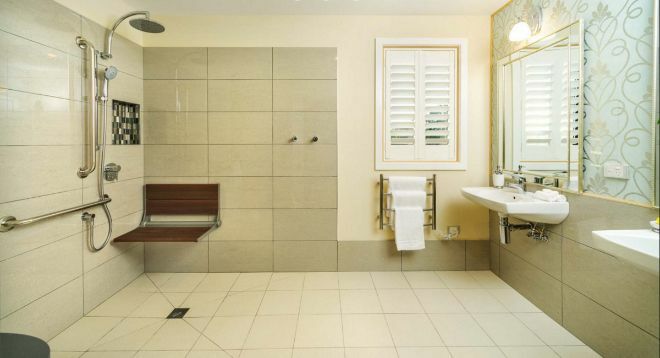 ​We're not sure about you, but this wet-area shower looks pretty cosy. When you're finished with your shower, you can dry off with a heated towel! ​"A guest-favourite" includes this cosy reading nook that includes a comfy place to curl up with one of the books stocked on the built-in bookshelf. 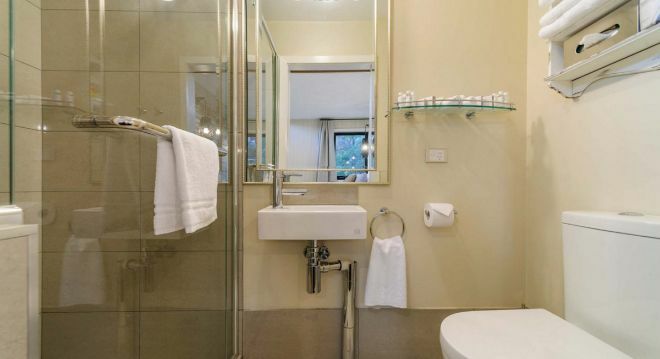 ​A second bathroom makes it easier for all guests to get ready in the morning. 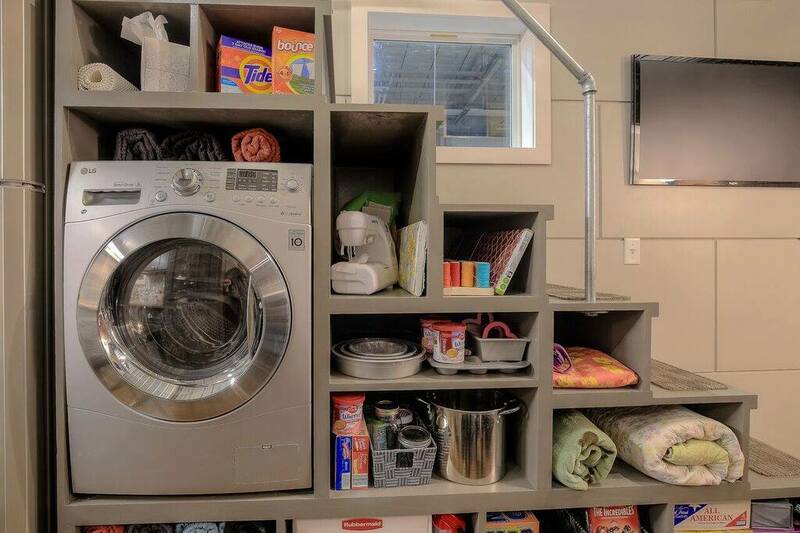 Each home also includes a washer and dryer, DVD player and DVD library, games, book and an outdoor fire pit. 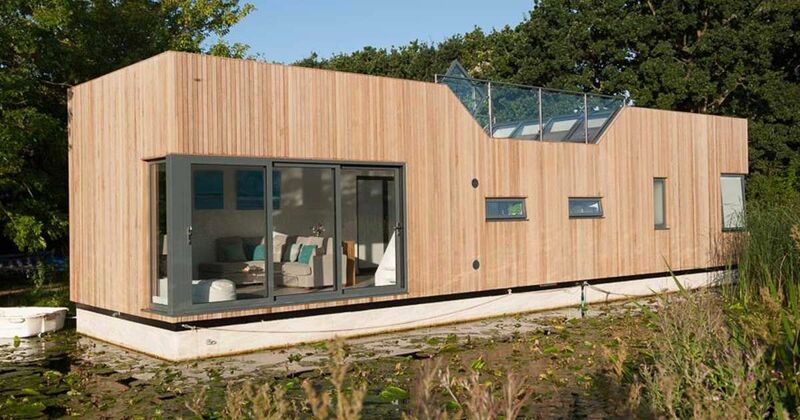 ​It's a house that floats, not a houseboat - that's the clear distinction. This interesting dwelling was designed took four months to complete. 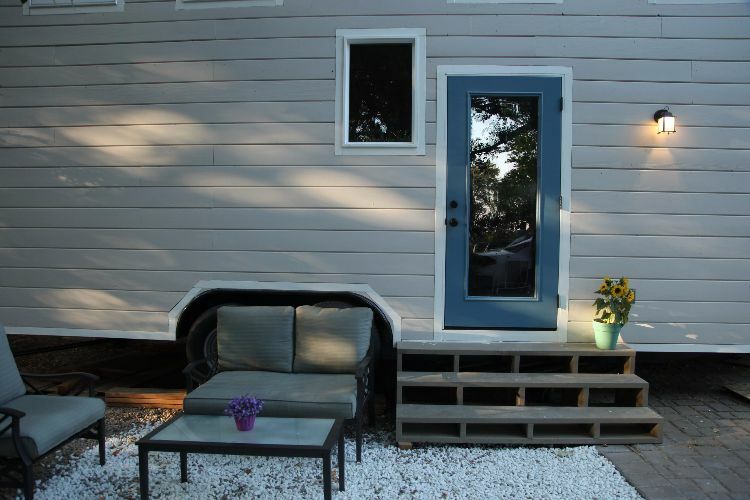 ​The house is constructed on a concrete hull foundation. The concrete hull was the first thing that was constructed, followed by the modular structure. 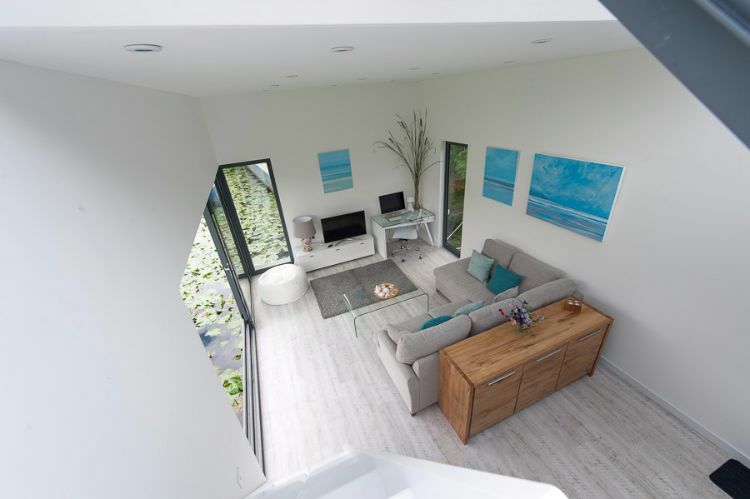 Although the floating home took only 4 months to build, the entire project was a culmination of 11 years of planning. Take a look at the living area, featuring a well-defined hub of relaxation and productivity. The ​​metallic lighting fixtures brings out a futuristic flair to the exquisitely furnished open dining area and kitchen. 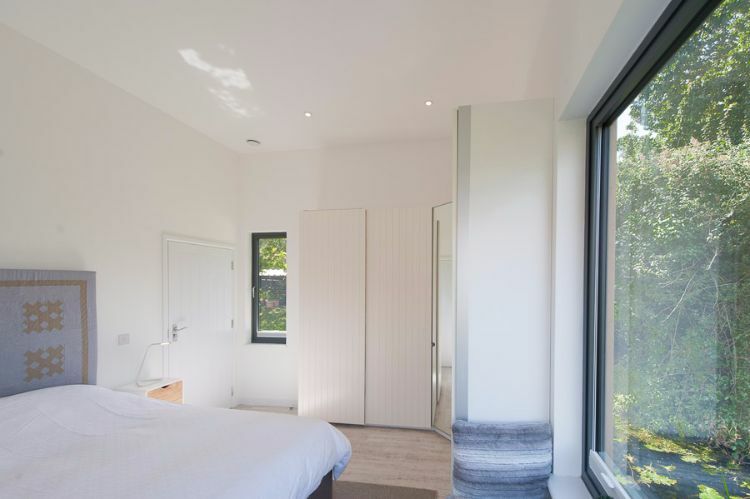 Large windows of the bedroom ensure that the home receives natural lighting contributing to energy conservation. The sleek composition of elements brings a special sparkle to this elegant bathroom. Whether this is your first time seeing their container homes or you're already a fan, you're certainly going to be in for a treat. 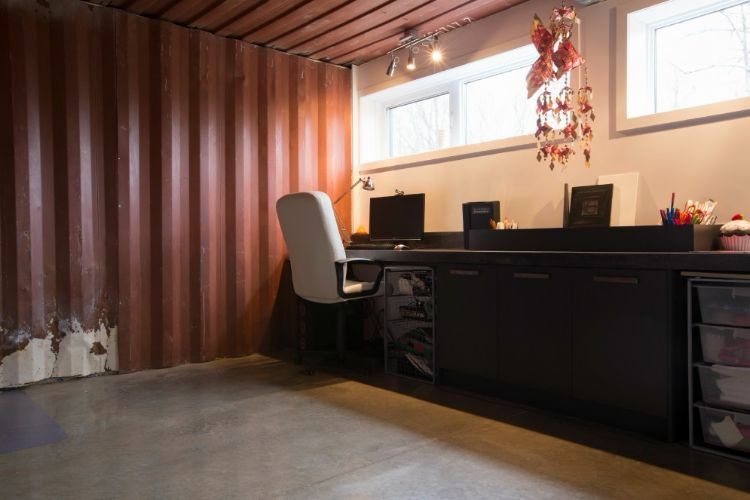 This container house is a 8-by-40-foot (2.44-by-12.19-meter) shipping container combined with of wood materials lining on its external siding. 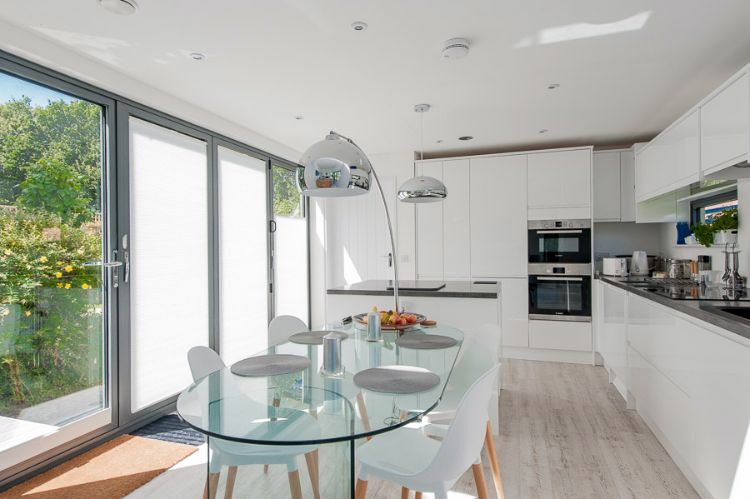 You only need to look at the different blends of textures and colours to see that attention to detail pays a crucial role in this home's design. ​Notice the matching reds and browns along the furnishings, flowers and decor. Deliberate or not, the simple placement of these elements effectively enhance the living area's classic aesthetics. 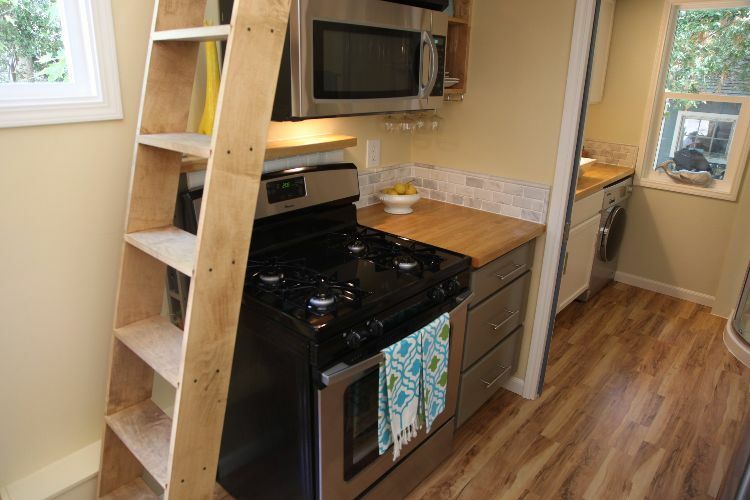 ​Right under the stairs is a demonstration of tiny living ingenuity at its very best. 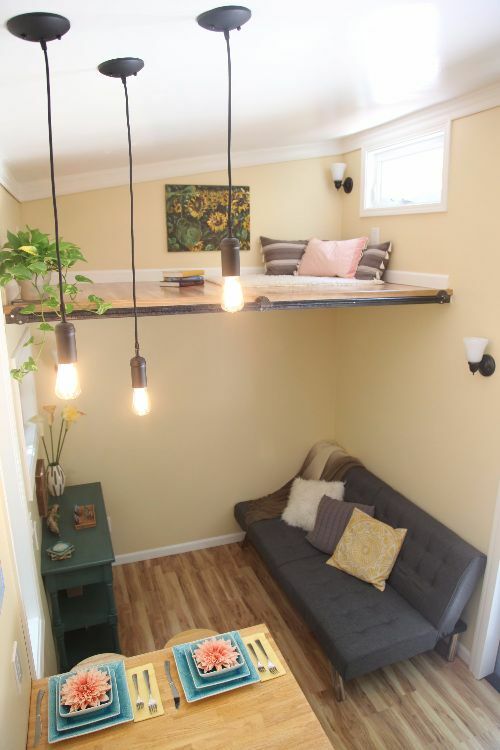 It always amazes us to see new and creative ways to make just the right amount of room for storage. ​Let's keep moving forward and into the bathroom. 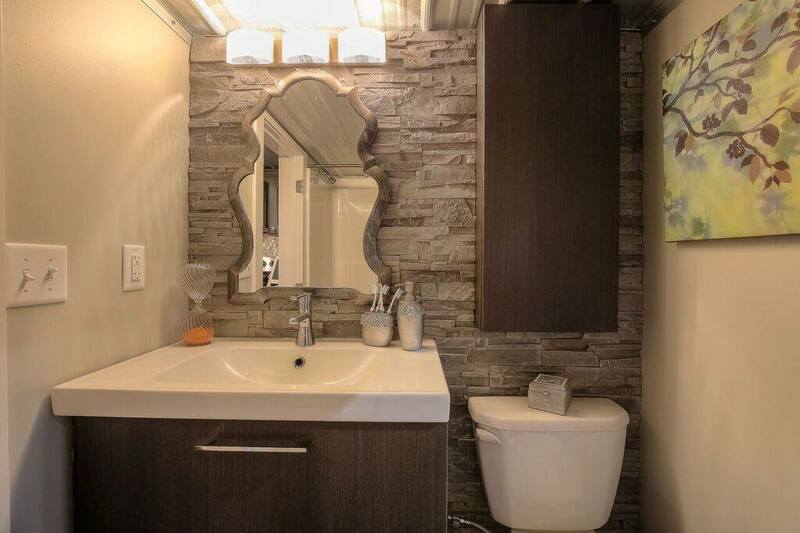 The contrast between your standard interior walls and the stone renditions make this bathroom elegant and chic. Holding true to their decorative artistry, a dash of color has been added to this room through simple ornaments like that hourglass by the mirror. ​Now, we get to the downstairs bedroom. Again, it is the small touches that make this room glimmer with grandeur. Anyone would greatly enjoy a bit of downtime in the comfort of a bedroom like this one. ​Especially with a bed with so many cushions! 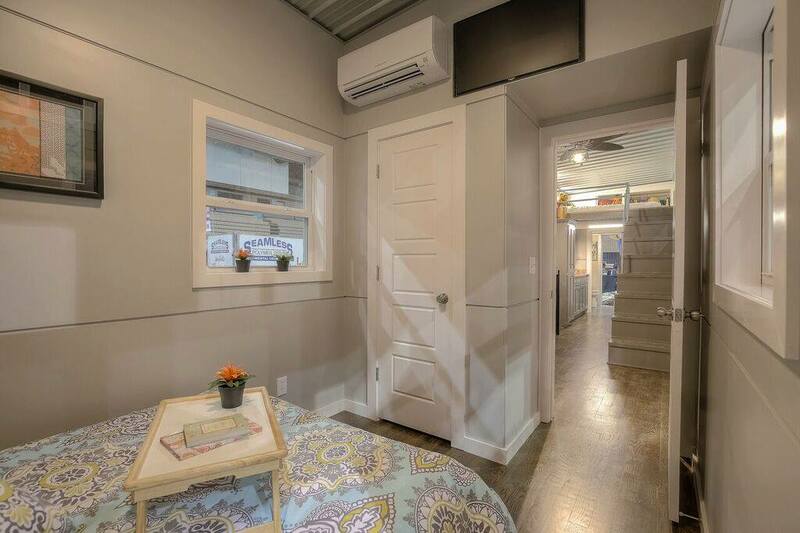 Before we say goodnight, though, there is just one more room to look at to conclude this container home tour. Which so happens to be the sleeping loft. 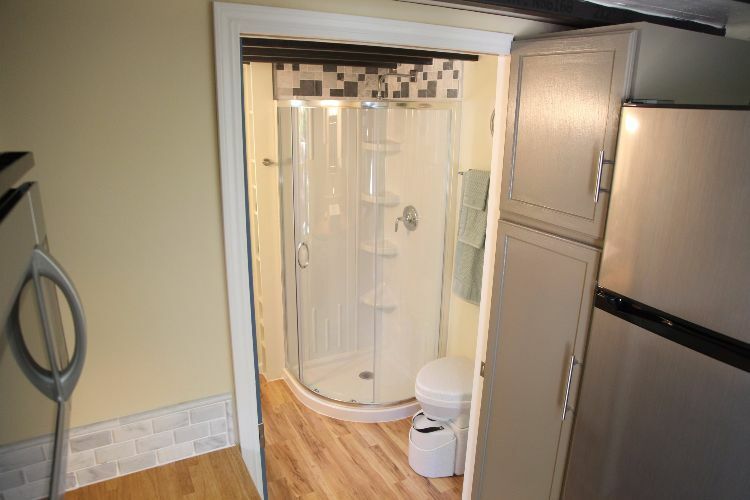 Seasoned aficionados will know that this room is unique for tiny home conventions. 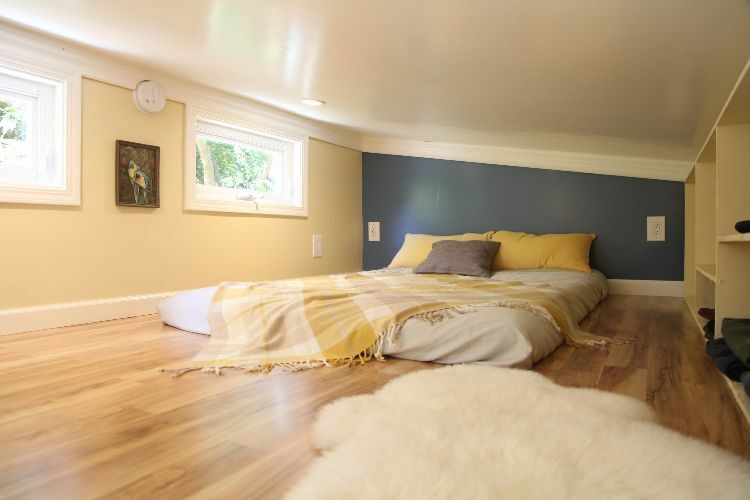 You see, one usually expects the upper sleeping area to be a couple's retreat - this one, however, seems to be accommodating a family with children. It must be said, though, that any kid would be happy with a spacious bed like this one. And if you are worried about safety, those protective rails by the staircase should do the trick. 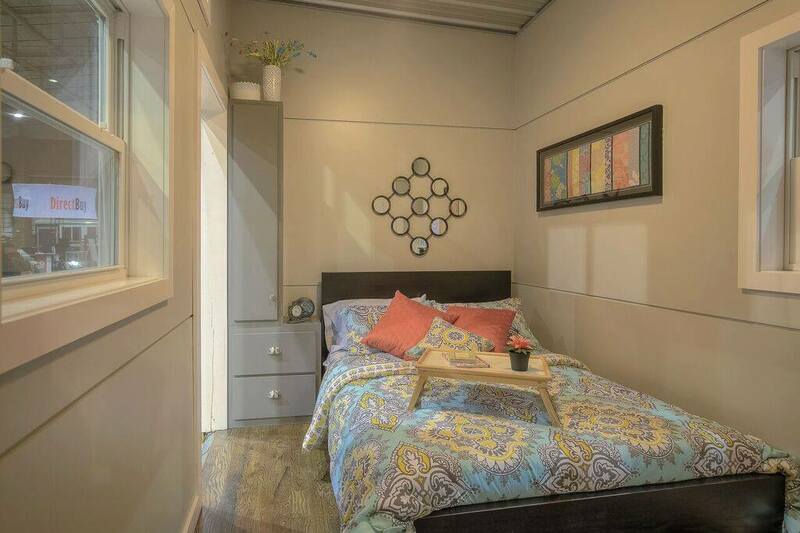 ​Once again, Custom Container Homes gave us a masterclass on how to get the most out of compact living. 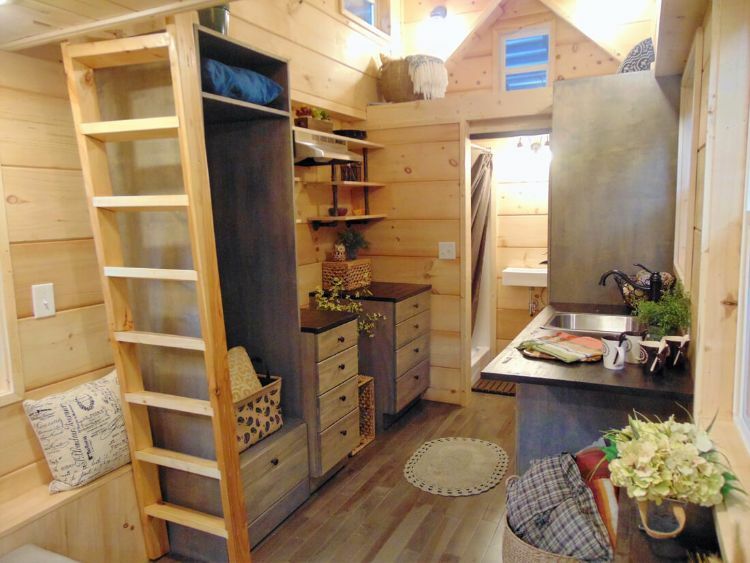 With its incredible use of space, all the right amenities and adornments abound, this humble abode flawlessly fulfills all tiny living wishes. The Ocean Residence Langkawi - where you'll find one of the most compelling pieces of container home architecture around. This Malaysian beach-side resort offers a sustainable, but very luxurious, accommodation choice for its guests. 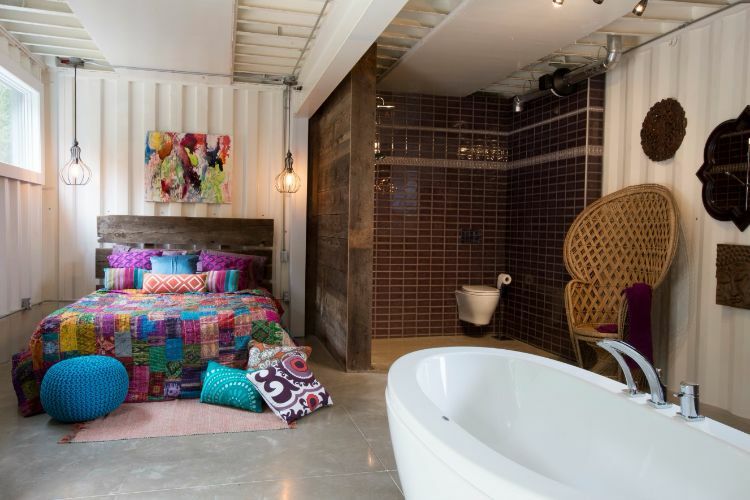 The Container House is one of the hotel's signature suites - and it's made almost entirely out of shipping containers. ​As you can see, brick walls separate each module. The metallic roof is quite remarkably designed too. 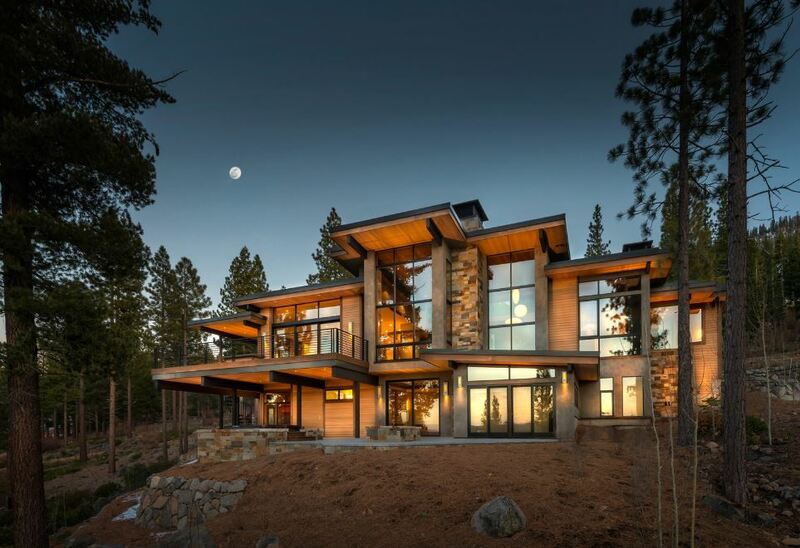 ​A side view shows us a harmonious blend of rustic and refined elements. ​The outside table and chairs ensure all guests get to soak up the plentiful oceanic views. ​Enter one of the suites to discover a hospitable living area. Red curtains and cushions match the Container House's exteriors. ​A cushioned bed brings some added comfort to this charming living space. 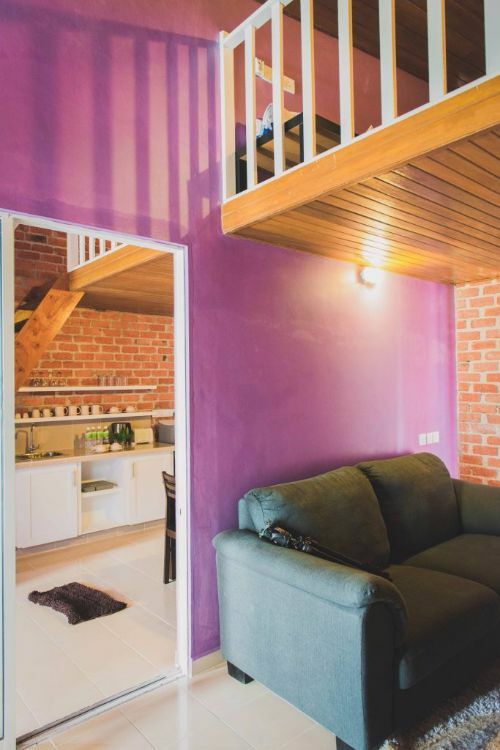 ​And a splash of purple brings a bit of liveliness to this abode. 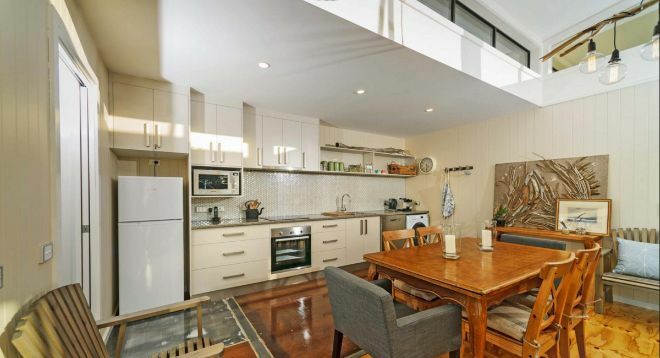 You'll also find the kitchen and dining area nestled right by the living room. ​Delicate floral paintings provide an interesting contrast to the final bedroom suite's brick walls. On the side, you'll find the elegant bathroom. 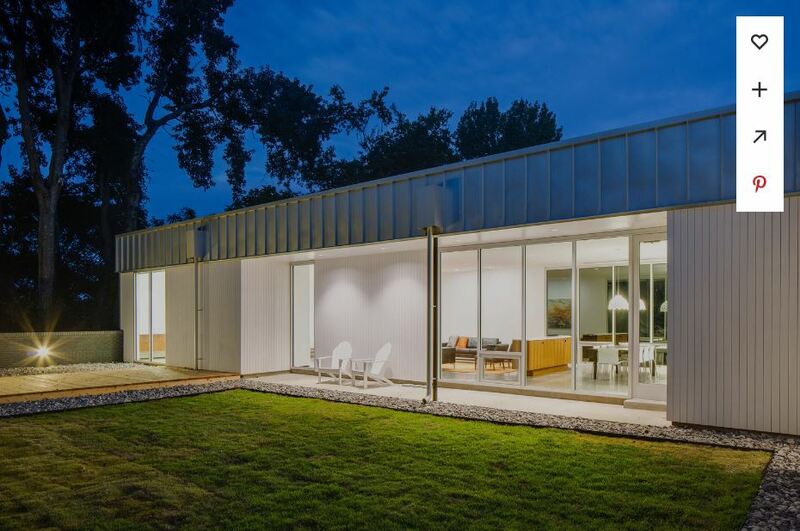 Could We use Shipping Containers To Build Sustainable Homes? 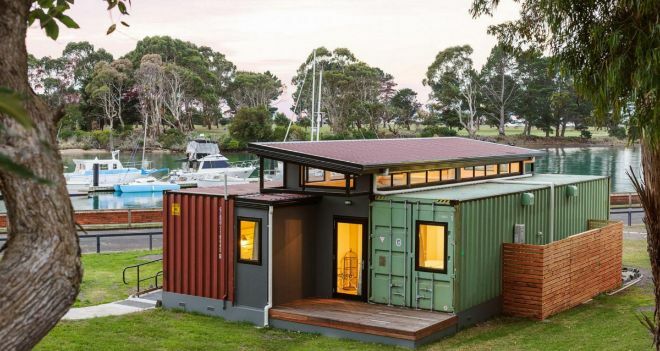 The first shipping container home, in the US, was built nearly ten years ago and since then shipping container homes have seen their popularity skyrocket. In-fact you’ve probably seen many of these homes being built in recent years. 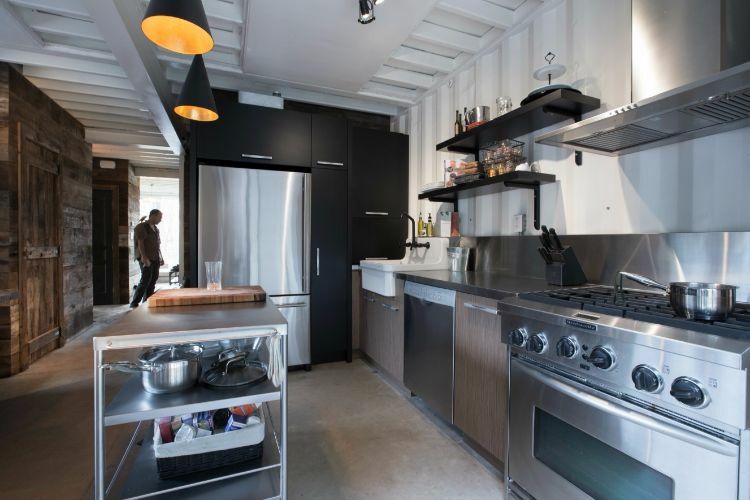 So, why are people turning to shipping containers to build their homes? Well, there are a growing number of people who do so because they’re looking for a sustainable way to build their homes. 1. How are shipping containers a sustainable solution? Each year in America thousands of these shipping containers are left dormant because American imports more than it exports and it’s too expensive to ship these containers empty back to Asia. 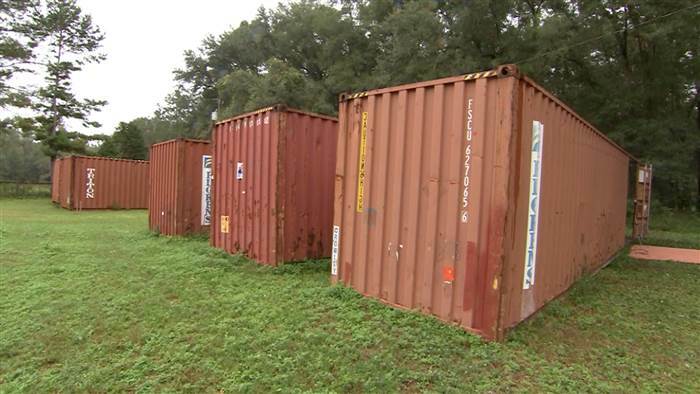 Just how many of these shipping containers are left dormant? We decided to find out by looking at statistics from the US Department of Transportation. In 2012 alone there was the equivalent of over 5 million 20 foot shipping containers left-over. So what can we do with all these containers- can’t we just melt them down and re-use the steel? Well we could however this would require nearly 8000 kWh of energy- which is a huge amount (nearly the same as a typical US household). So what other options are there? Well in the past recycled shipping containers have been used to build: swimming pools, hospitals, schools, Restaurants and more. However one of these options is to build homes with them. 2. 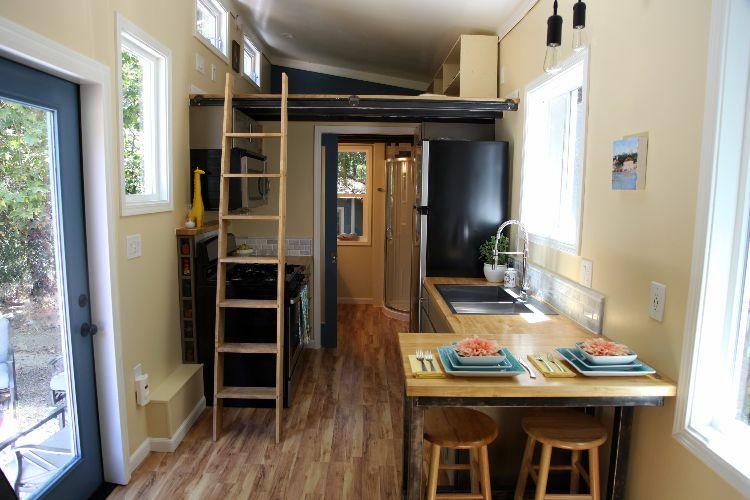 What’s it like Living in a Container Home? With this sudden rise in people choosing to build and live in shipping container homes, last weekcontainerhomeplans.org, decided to interview numerous shipping container home owners to find out exactly what it’s like to live in a shipping container home and what they wish they knew before they built their own shipping container home. 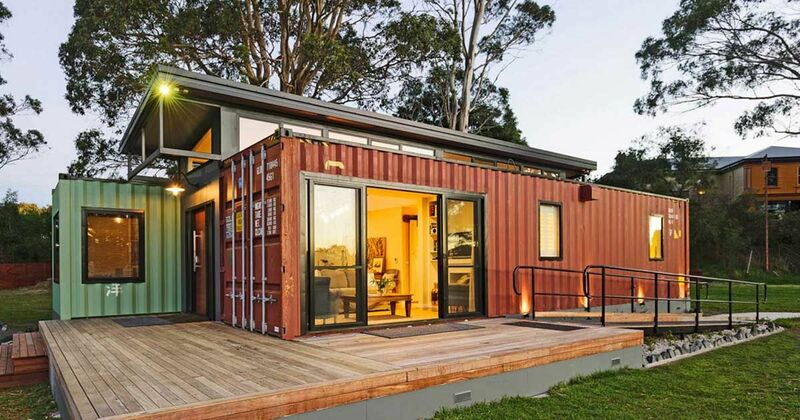 The most common thing people wanted to know was ‘which is the correct shipping container to purchase and build with’. The second most common thing people said they wish they’d known was ‘how to get a planning permit’. And the third most common thing people wanted to know what ‘how to find a builder with previous experience of building containers homes’. Why else are people building homes with containers? 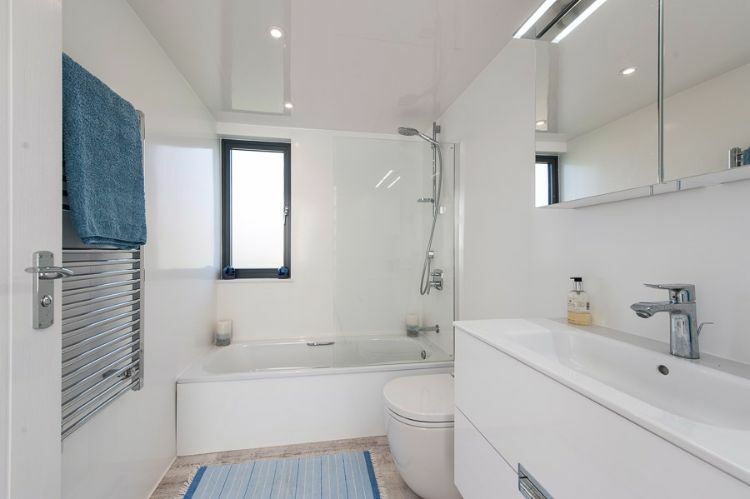 Sustainability seems to be the most common reason why people are building their homes with these containers, however two other reasons can also be found. 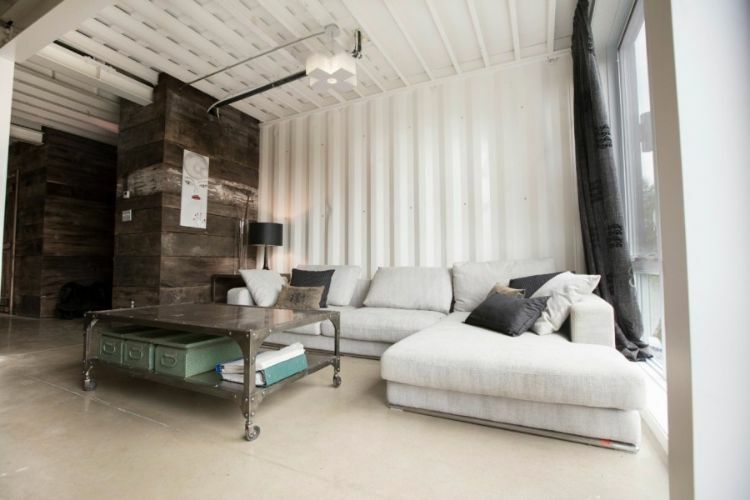 A used 40 foot shipping container, which provides over 300 square foot of living space, can be purchased for a cheap price and when you stack a few of these together you soon have a large living space. 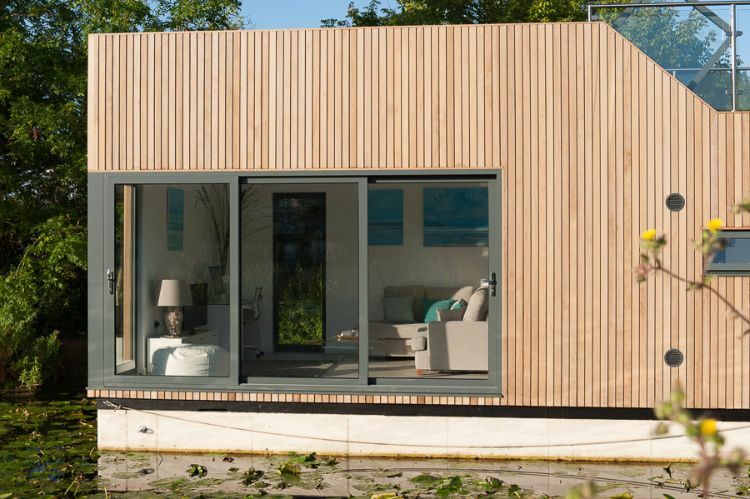 Container homes can be built in a matter of weeks- all that is required is simply to stack the containers up together. Once the containers are in place you just need to cut your openings (door and windows) and insulate the containers. It’s this speed that means shipping containers are perfect for disaster relief housing. ​Tiny homes have been the talk of the town for 2015, but 2017 might bring a new housing trend: homes made from shipping containers. 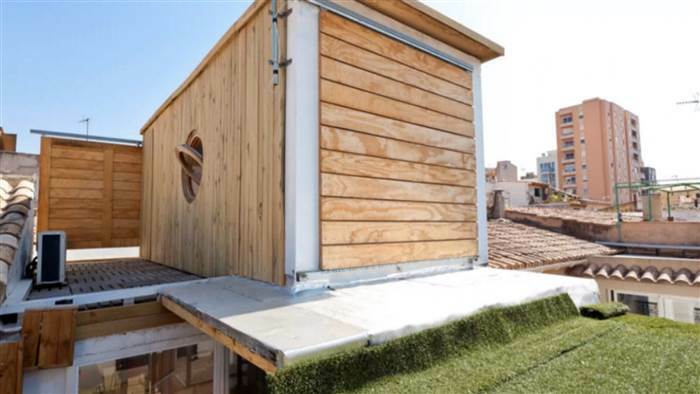 The new idea has been a winner overseas, with cargo containers serving as apartments in the Netherlands and as designer homes in Spain, and they’re beginning to win over millennials that are more cost-conscious. 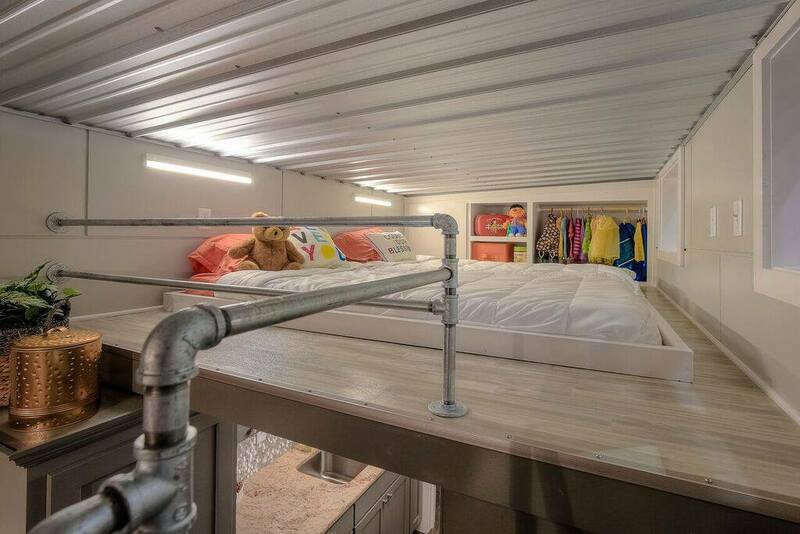 Florida resident Tom Fox has lived in a four-bedroom, three-bathroom shipping container house. The three-story home cost him $55 per square foot, versus regular construction which would have set him back $100 per square foot. And while it may not be the most beautiful home ever built, it’s certainly one of the less expensive ones in the area.